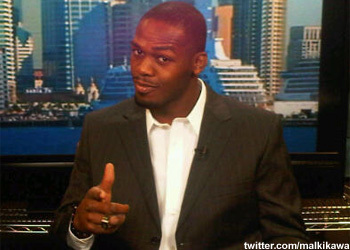 For a skyrocketing 23-year-old superstar, Jon Jones is about as grounded and humble as they come. After hearing his next potential victory would come against Ryan Bader during Super Bowl weekend, it appears you can add blunt to the plethora of things used to describe the phenom. This past Friday, MMA’s Next Coming appeared as a guest on Inside MMA and didn’t appear too thrilled with the prospects of facing the All-American wrestler. While he may have sidestepped dissing Bader’s game directly, Jones wasn’t as reserved after his manager Malki Kawa confirmed his February 5th date on Monday evening. As if slighting Bader’s bread and butter wasn’t enough, Jones also noticed the chiseled Arizona State stud isn’t the best conditioned athlete in the game. While he was clearly sucking wind against Little Nog in the latter rounds, “Bones” had observed Bader’s breathing issues prior to his uneventful unanimous decision over the veteran. It was reported prior to UFC 119 that the winner would be fed to the Greg Jackson trained fighter in their next outing. Now that Jones has been given his next assignment, he’s wasted no time in cracking the books. “I was studying him and Nogueira, but now that I know it’s Bader I’m watching all his fights, all his interviews – I’m obsessed with the guy. It’s a great feeling,” Jones stated. “I want to get to know Ryan Bader as if I was his coach or his trainer. I want to know what his tendencies are, what punch he throws the most, what makes him want to shoot his double-leg, where is his mental security blanket is in the Octagon. Although Jones was quick to pick apart Bader’s game, he’s smart enough to understand “Darth” didn’t just stumble upon his perfect 12-0 resume.